We are indulged in providing of Oil and Petroleum Testing Instruments. All our instruments are reliable and durable. 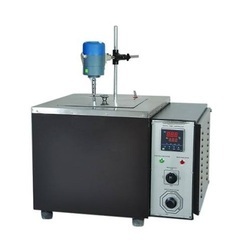 We offer pensky martin appratur, redwood viscometer, kinematic viscometer battery. All these instruments are offered at market leading rates. This category included manufacturers, exporters, traders, distributors of Petroleum Testing Instruments e.g Cloud & Pour Point Apparatus, Kinematic Viscometer Bath, Abel Flash Point Apparatus, Sulphur by Bomb Apparatus, Oxidation Test of Lubrication Oil, Rolling Stability Apparatus, Petroleum Hydrometer, Adiabatic Bomb Calorimeter, Redwood Viscometer, ASTM Color Comparator, Ramsbottom Carbon Residule Apparatus, Bomb Calorimeter, Rust Preventing Characteristics Apparatus, Conradson Carbon Residue Apparatus, Saybolt Viscometer, Dean & Stark Apparatus, Azhn Viscometer Drop Point of Grease Apparatus, Engler Viscometer, Evaporation loss of Lubricating grease, Electric Strength Apparatus, Grease Worker, Flow Cup Viscometer, Heat Stability of Grease Apparatus, Falling Ball Apparatus, Oxidation Stability of Grease Apparatus, Freezing Point Apparatus, Penetrometer, Karl Fisher Apparatus, Pensky Martens Flash Point Apparatus etc..
Advanced technocracy inc. Is manufacturer, exporter & supplier of Elasticity Of Oil Equipments Suppliers. Double wall construction. Inner chamber made of highly polished stainless steel sheet and the outer is made of mild sl duly finished in white stoving enamel/powder coated paint with mat finished colour combination. Temperature range 50 C to 250 C +- 2 C is controlled by a thermostat. Supplied complete with stirrer, diffuser shelves, cover etc. Chamber size in mm & inches Approx. Looking for Oil And Petroleum Testing Instruments ?